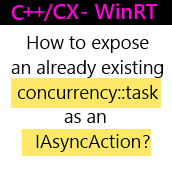 C++/CX : How to expose/convert an existing concurrency::task to Windows::Foundation::IAsyncAction^ ? 😮 I am really writing a blog post on C++ ? Yest it seems so :). 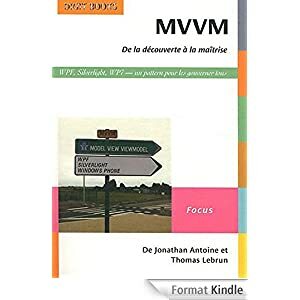 At this year MVP Summit I discovered how much fun I can have with C++ (and especially C++/Cx in my case) thanks to Simon Ferquel and Bruno Boucard. concurrency::task are available through the “ppltasks.h” header files and can be considered as the TPL tasks in C#. One of the first thing I tried to do in a C++ component is to create a concurrency::task, use it and expose it as a IAsyncAction to the other C#/JS component. But in my case, the task is already created. So the only solution I found to this issue is to create a lambda which returns my task and feed the create_async method with it. As the lambda returns a task, the create_async will create a IAsyncAction/Operation which will wait for the completion of the init task too. Do you know a better way to do this ?